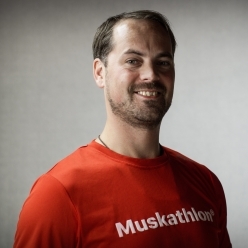 I want to run a Muskathlon, because I want to bring hope to the world and see extreme poverty defeated in my life time. I am willing to sacrifice my comfortable life and make my personal contribution to help end the injustice of extreme poverty. In order to change this brutal reality for so many people, I will make humble efforts to be a better runner each month. (As I write this, I can now run around 5 km without getting exhausted. I must reach 21 km in 11 months time.) In doing this for Love, I believe that I can inspire courage, optimism, creativity, sacrificial love and generosity in the people around me. They will rally around me as I raise my set goal of €33.000 for Compassion and my success will be their success too. The Best is yet to come! :) Cheers. Dies gilt für € . 1.000 , - für Dirk ist Muskathlon .